The short-necked turtle is a small freshwater turtle and Australia's most critically endangered reptile. It has a square-shaped, flattened shell which varies in color from yellow-brown to black, and its undershell is paler with black spots. There is a single large bony plate on the head, and its neck is very short and covered with horny tubercles. Its legs are covered with bony plates and the feet are clawed. Adult males grow up to 15 cm and can weigh up to 550 grams. Females are usually smaller than males. 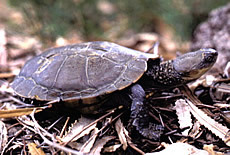 The short-necked turtle can be found in scattered locations of a narrow strip of the Swan Coastal Plain in Australia where they inhabit shallow swamps. Most of the swamps contain shrubs that form canopies one to two meters above the water level over open tall sedges. When the swamps dry up (in the late spring), they leave the swamps to spend the summer in natural underground holes, rabbit burrows, or under leaf litter. This "aestivation" period ends in autumn between May and June when the swamps begin to fill again. Mating occurs in the winter and only in the water. The female lays three to five eggs, and the eggs hatch after 180 days of incubation. The short-necked turtle has suffered a severe reduction in numbers and has declined from an estimated population of 250 in the 1960s to around 15 to 25 today. This species has a restricted distribution and depends on its swamp habitat which has been greatly reduced and disturbed by draining and filling for agricultural purposes. The species also suffers predation by the introduced red fox. Conservation efforts include a recovery plan developed by the Australian government, a captive breeding program at the Perth Zoo in Australia, and protected individuals and swamps found in two nature reserves. Copyright Notice: This article is licensed under the GNU Free Documentation License. It uses material from the Wikipedia article "Western swamp turtle". Glenn, C. R. 2006. "Earth's Endangered Creatures - Short-necked Turtle Facts" (Online). Accessed 4/25/2019 at http://earthsendangered.com/profile.asp?sp=484&ID=4. Need more Short-necked Turtle facts?